Dark money is shady business. Although this type of political expenditure has been around for a long time, the U.S. Supreme Court’s decision inCitizens United opened the floodgates. 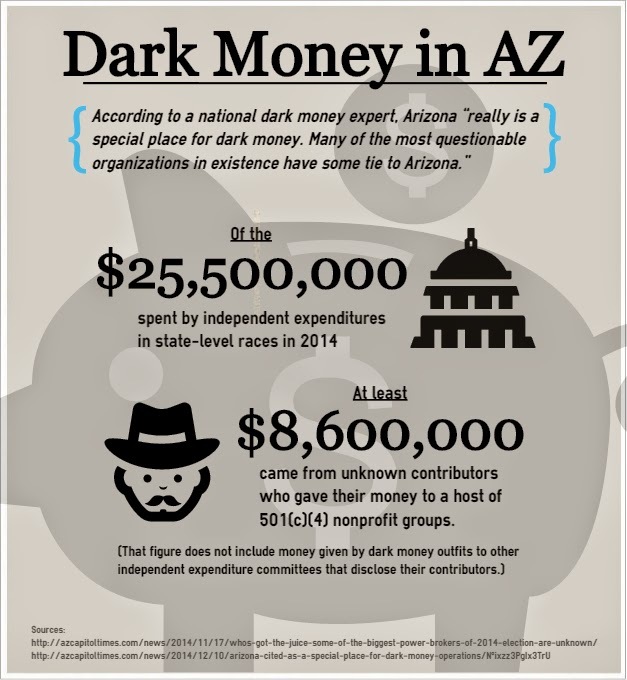 Some reports indicate $8.6 million in dark money seeped its way into Arizona’s election process. SB1206/ Independent expenditures; corporations; funding disclosures: This legislation would require the four largest contributors and any large contribution from out of state to be included and clearly displayed on the disclaimer statement of corporate independent expenditures. It would also require corporations, limited liability companies and labor organizations that make independent expenditures to file campaign finance reports if they receive contributions for their expenditures. This is what political committees must do. SB1207/ Campaign finance disclosures; corporations; entities: This reform would revise the “paid for by” disclaimer for political committees to include the names and telephone numbers of the three largest contributors including corporations, LLCs and labor organizations. Currently, the law only requires the disclaimer to include the three largest political committees. SB1208/ Foreign nonprofit corporations; foreign LLCs: This legislation would change the definition of “conducting affairs” for out-of-state businesses to include spending money for the purpose of influencing the outcome of an election in Arizona. It would prohibit foreign companies from spending money to influence elections until they are authorized to do business in Arizona and would place the same restrictions on an LLC. The purpose of this legislation is to require any out-of-state entities to register with the corporation commission before they make independent expenditures. SB1209/ Independent expenditures; corporations; unions; audit: This reform would authorize the Citizens Clean Elections Commission to conduct random audits of corporations, LLCs and labor organizations that make independent expenditures. The audit would include a review of notifications, related documentation and other financial records to determine whether the entity is complying with Arizona law related to corporate independent expenditures. The audit would be confidential unless the commission finds that a violation has occurred, in which case the commission shall notify the Secretary of State’s office of the violation. This audit provision is intended to ensure corporations are complying with current law and mirrors the audit process that the Citizens Clean Elections Commission conducts for candidates. "With the recent judge's ruling that throws out the state's definition of political committee, we have the opportunity to make meaningful changes to our disclosure laws," said Senator Quezada. "Voters are tired of the presence of anonymous money in their elections and they deserve to know who is buying their elected officials. The sad reality is that our proposed legislation to eliminate dark money from our state will most likely never see the light of day - kept in the dark just like the people of Arizona." 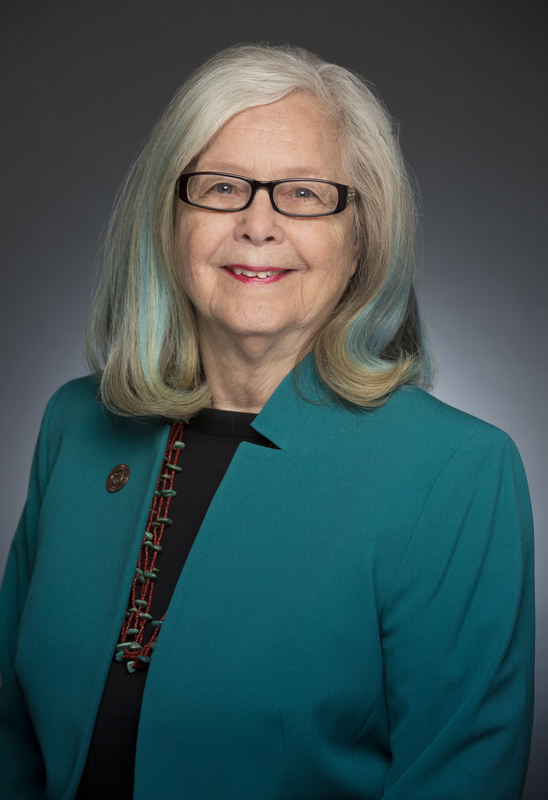 Senator Steve Farley, D-Tucson (District 9), has introduced SB1101, which is identical to the bill that Secretary of State Michelle Reagan introduced as SB1403 last year when she was still in the Senate. "A central focus of SB1403 is on Arizona’s many shell corporations or “convenience corporations” that seek to influence elections without revealing the identity of their funders. The bill outlaws attempts to hide the identity of donors by the creation of such entities and by funneling funds from one organization to another. To enforce the law, the Secretary of State, acting upon a complaint, would have wide authority to determine if a group or organization is primarily engaged in electioneering. If so, it would be regulated as a political committee and be subject to disclosure." Additionally, Rep. Ken Clark, D-Phoenix (District 24), will introduce a bill that would require utility companies to disclose contributions made to influence an election. Clark said this reform is necessary because of “what was very likely an unprecedented shift” from utility companies. Many believe that the utility companies were contributing heavily in the 2014 Corporation Commission elections.